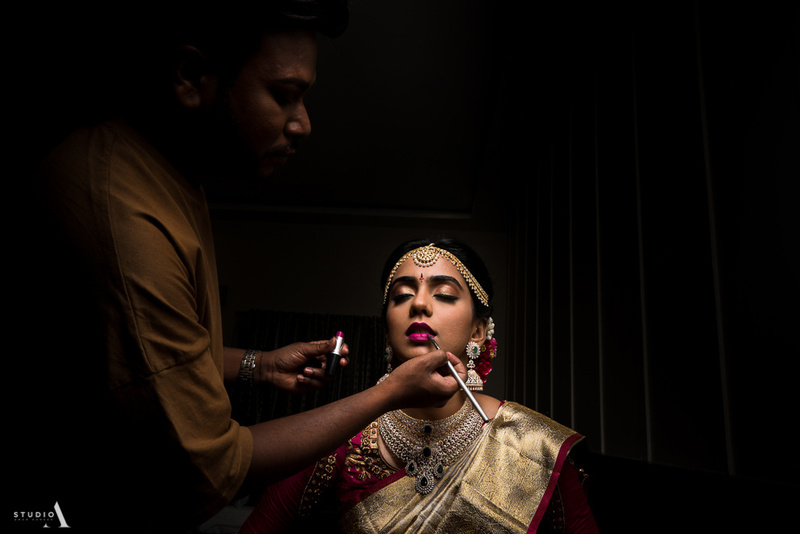 Having shot over 300-plus weddings across the world I can vouch for the fact that this phase when the bride and the groom get ready is easily the favorite phase for many wedding photographers. Because it is when the about-to-be-weds are in their own world of thoughts, after which they will merge into the wedding chaos that takes over. So with enough pre-planning, one can utilize the exclusive time and space and come up with interesting shots. From my experience, here are few tips that will come in handy during the process. 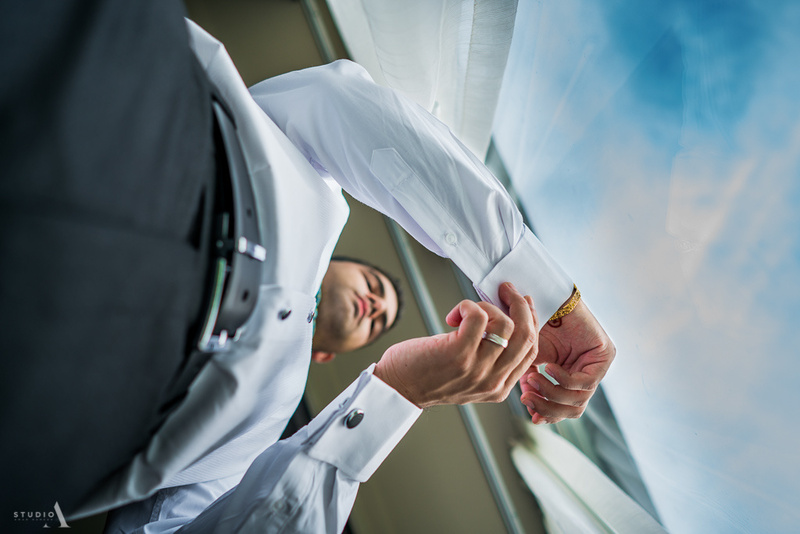 You're planning has to start with the couple right from the initial stage when they hire you. 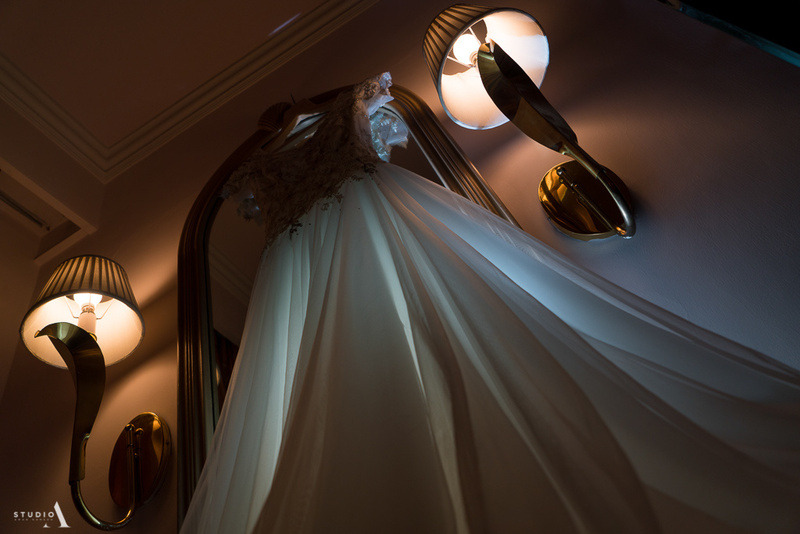 The bride and the groom will have their favorite ideas and thoughts on how their getting ready photos should be. Strike a conversation and understand their expectations. Note down the venue, the timings, their attire and all the essential information. This very well gives you a clue on planning things. Once you have their inputs, you can sit back and plan the process. Share few inspiration shots with the clients and get their feedback on the possibility of trying them out. Failing to pre-plan will put you in a spot where you will have few options to try out later on the big day. Time is time, more than money. It is essential that you get the most of it to bring out the best. 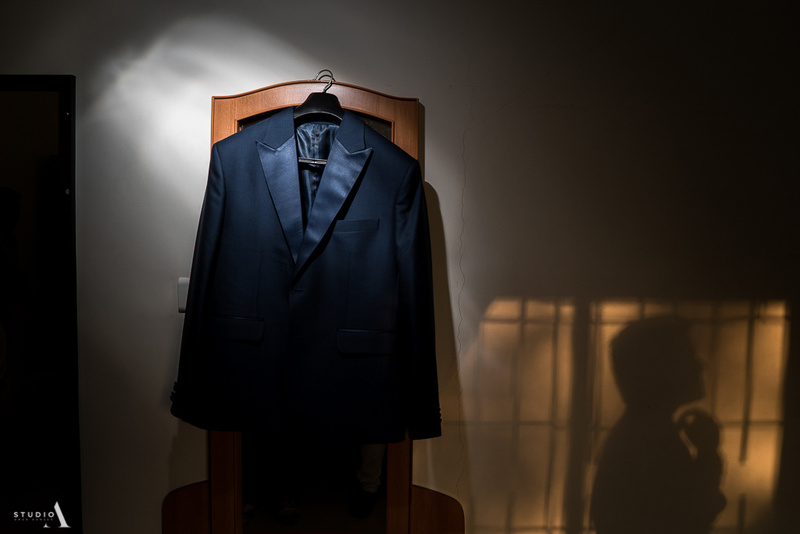 At times the wedding photographers are asked to come way earlier to the venue, even if the couple arrives late. That should be fine. After all, it is their big day and there will be so many things running through their minds and schedule. So relax, set your priorities, and be committed. Being there earlier only gives you the advantage to scout the venue and visualize shots in different perspectives. The getting ready spot is your universe. You have to be the master in seeing how well you can make use of it. In fact, it is better if you discuss on this topic with the client during the initial conversations to understand how well lit the place is with natural light, number of people who will be inside the room, and the kind of elements you'd appreciate having in and out of the frame. Also, advise them on having their friends and family get ready in a separate room. If you can make your place complement the shots you envision, the output will naturally lend to great shots. 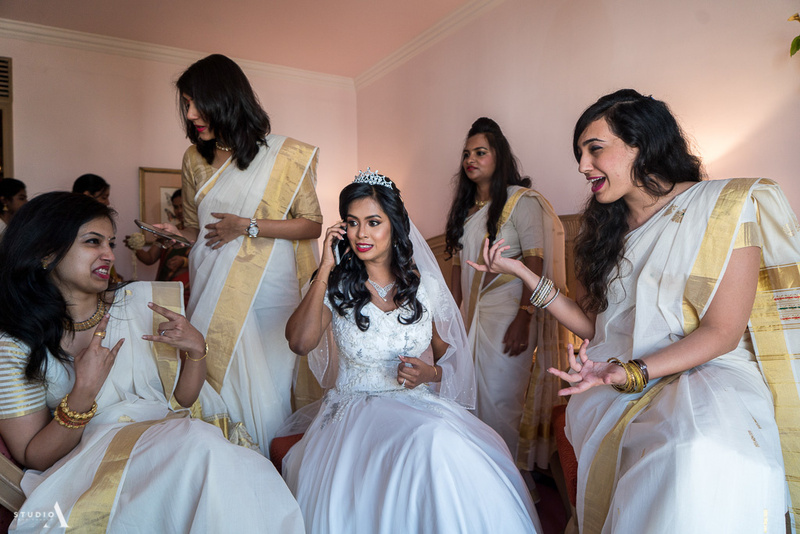 There is a set pattern of routine that the bride and the groom might have in place already when they are getting ready. It is best to have a note of this and jot down the order of things. Following this natural flow of things with a pre-meditated mind will help you come up with planned shots. This makes for a sure set of getting ready pictures, on the top of which you can contemplate your creative shots. Advise the couple to keep the number of people in the prep-room to be small in number. The more crowded it is, the more tedious it gets to move around and get shots. Also, clean up all the clutter inside the room and make sure you have enough space. 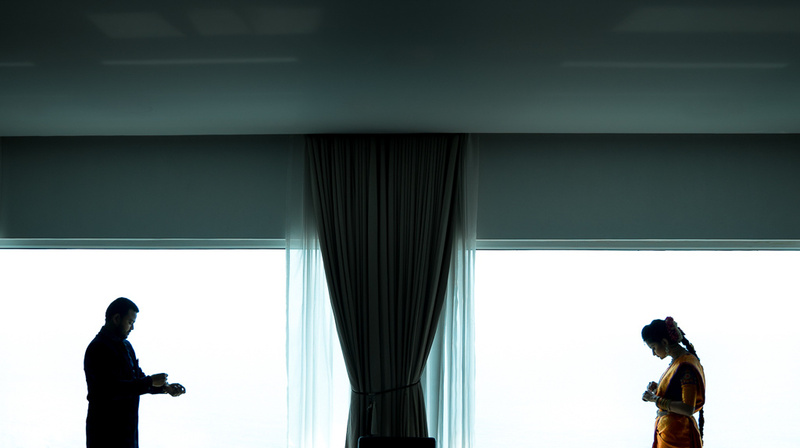 Try to keep it minimal, when it comes to the elements that you include in the frame. It is best to have a lot of negative space. By having just the bride, groom, or the couple together, you can plan to create a mood in the pictures. We talked about keeping it minimal. But then, you can control things only up to a certain extent. Where there are more elements or people in the room that you can't avoid, try to include them creatively inside and utilize the situation to your advantage. 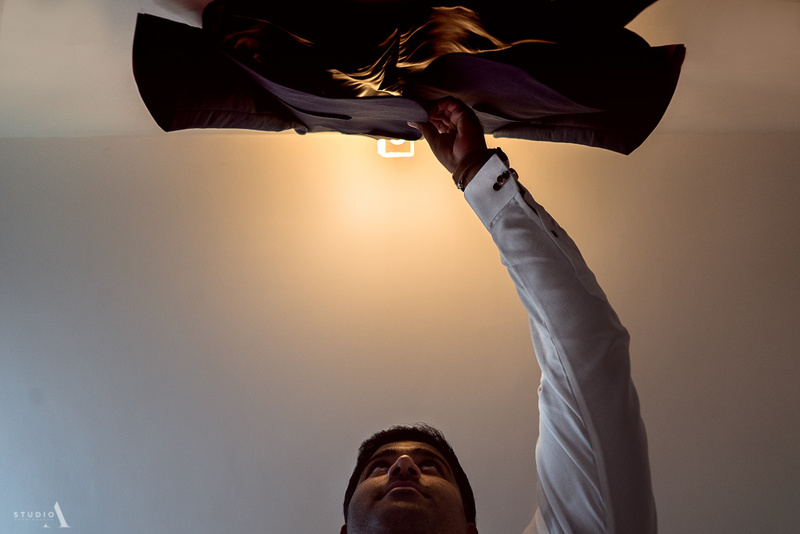 For instance, this is one of my favorite getting ready shots from a wedding I shot last year. I had arrived a little earlier and was waiting, looking at things and contemplating on creating a shot out of the elements in the room. I noticed a lot of table lamps spread across the room. 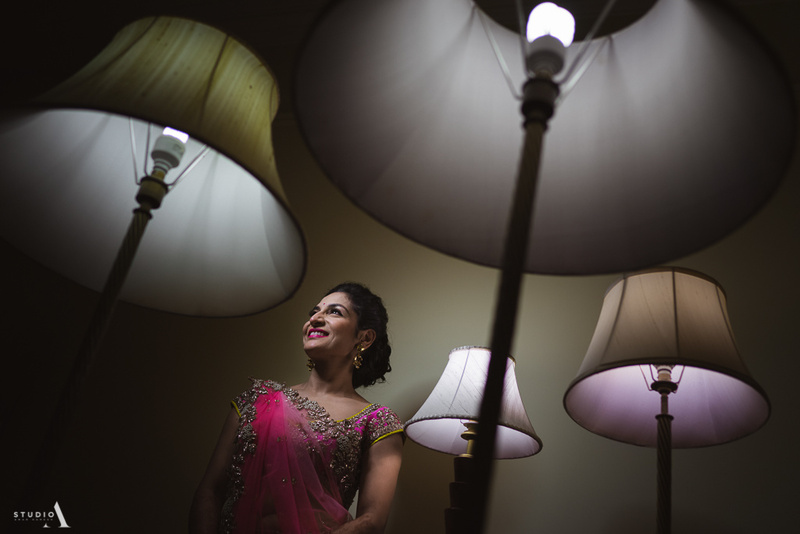 I imagined this shot with the bride in the middle and these lamps adorning her. I kind of liked the idea, and the bride loved it too. Similarly, when there are the best friends who accompany the scene, get them in the frame and try a group sho that holds the drama. As much as you plan the shots in prior, you also have to stay with an open mind to capture what comes your way by surprise. Use your presence of mind and respond quickly to the little moments that happen spontaneously. 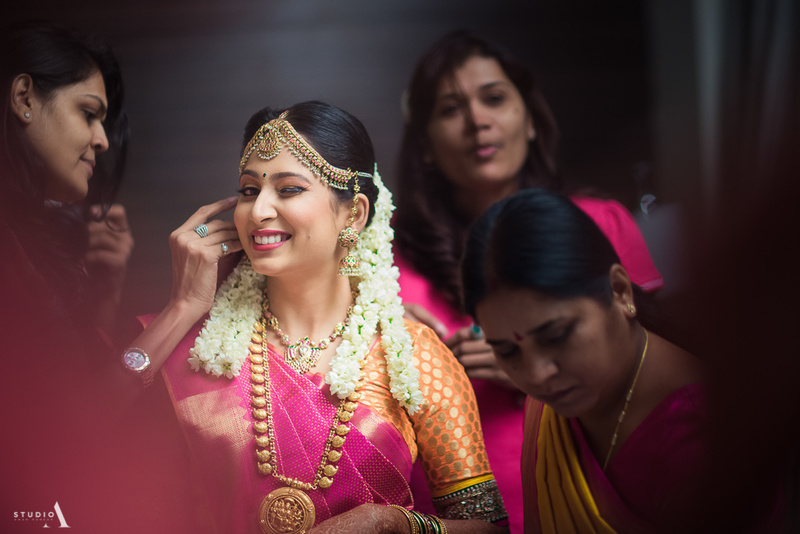 Like the bride winking, or the groom adjusting his collar; little moments like these are best captured candidly rather than asking them to pose for it. 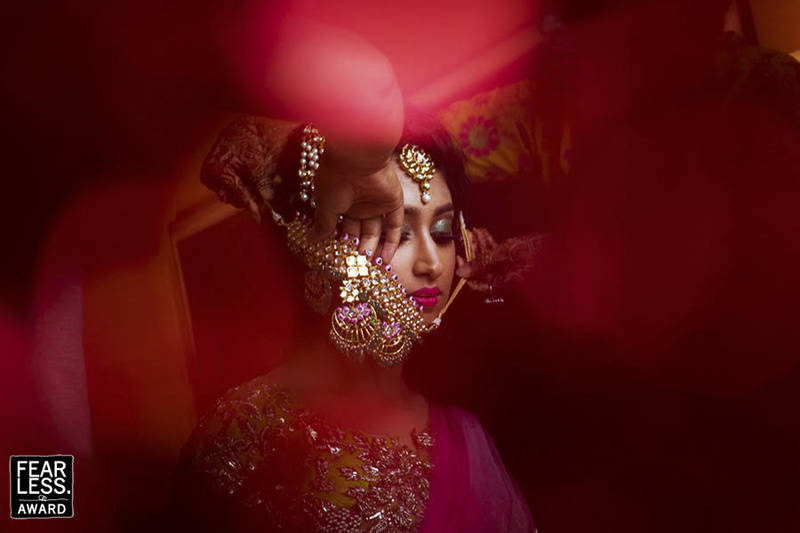 As much as you take individual shots, it is a wise idea to include both of them in the frame a create getting ready shots of the couple together. It is important that you tell your story in every picture. 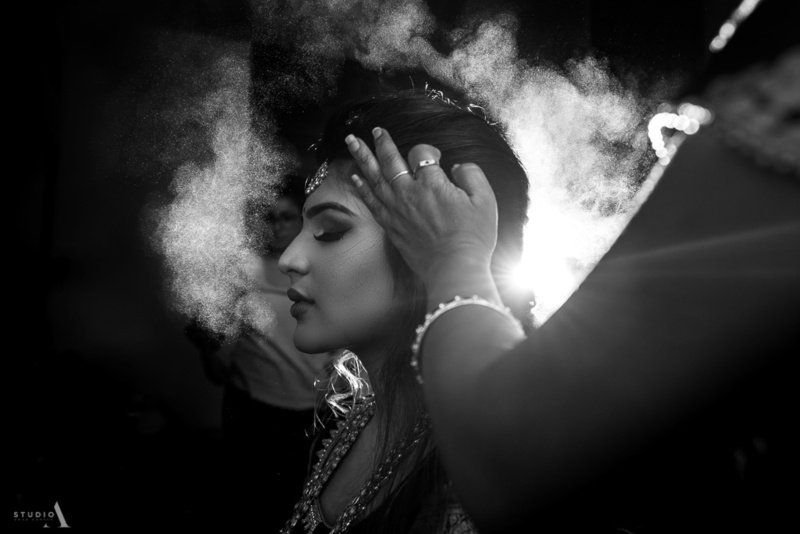 Yes, there will be a lot of candid moments but as a wedding photographer who is ready to go beyond the ordinary and capture amazing shots, you should focus on bringing out your unique vision into the pictures. For instance, this is one of my favorite getting ready shots that I shot last year. 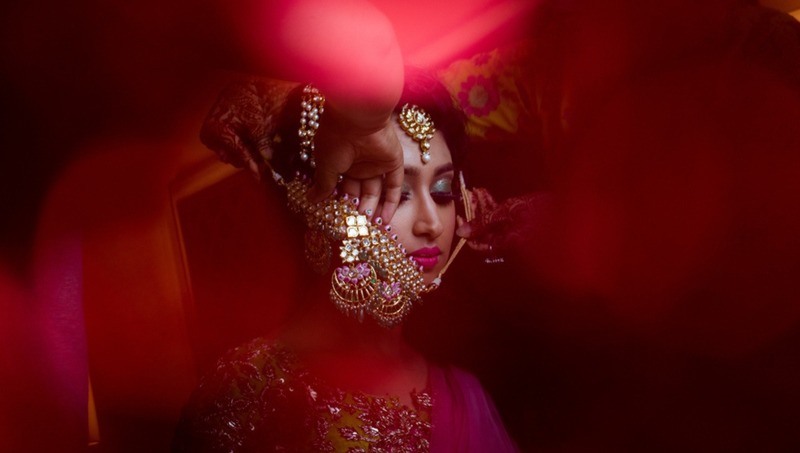 The bride was immersed in the wedding mood and I wanted to capture her state of mind of "dreamy." So a little imagination, visualization, and a planned obstruction to the lens to get that dreamy effect was all it took to get this shot. Eventually, this went on to win my first fearless award too. Lastly, you can focus on the details of the attire, the jewelry, and all the details that will make for nice memories at the end of the day. Make sure you don't just shoot what is obvious but attach a context to it. So there are my two cents. I'd love to hear if there are any points that we can add to the list. Shoot your ideas. Thanks, for the tips. 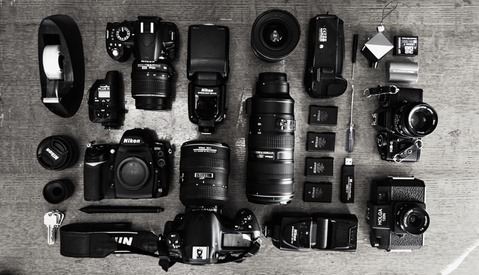 I will definitely follow your tips.Wedding photography is playing a very major role in our life. Without it we can't save our memories. In my marriage time, I contacted with http://jonmarkphoto.com/ and they captured my wedding ceremony in their camera in a very beautiful way. I just love that work.